The organised stifling of anti-Israeli criticism is nothing new. A key plank of the Zionist state’s PR strategy, it is a recurring theme across the media, civil society sector, politics and academia. Perhaps then it should have come as little surprise to see the University of California, Berkeley targeted for laying on a course that seeks to view the Zionist state through the lens of settler colonialism. Few, certainly most who don’t subscribe to the exclusivist notion that God himself gave the land to the Jewish people, would dispute that Israel shares many of the characteristics of a colonial state: scientific/racist notions of cultural supremacy, expulsion of native inhabitants, settlement on the expropriated land, military subjugation of the native population, and institutionalised discrimination based on ethnicity/faith to name a few. For most, including many Jewish historians, this is a matter of current and historical record. So why did the powers who run Berkeley decide, before swiftly reversing their decision, to suspend the course called ‘Palestine: A Settler Colonial Inquiry’ almost as soon as it had got underway? The official line from Berkeley was that the course had not received “a sufficient degree of scrutiny to ensure that the syllabus met the university’s academic standards”. 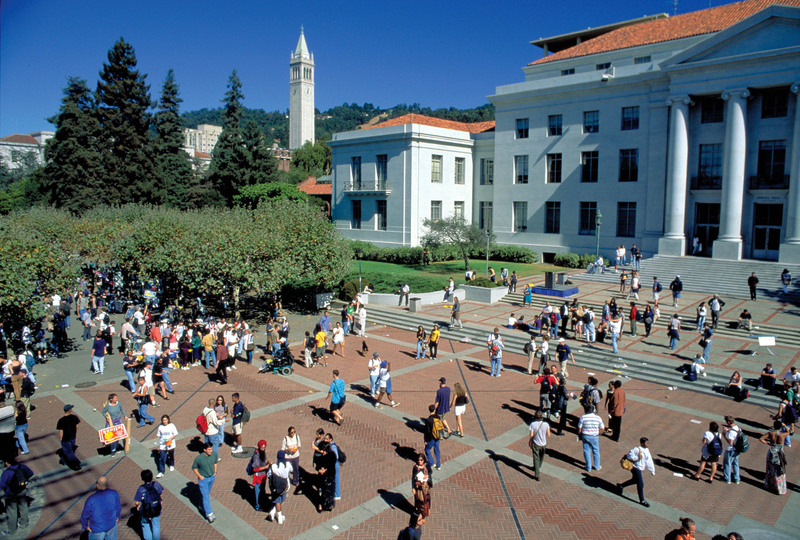 But that was hard to square with the fact that the course had already passed Berkeley’s review and approval procedures. Of course it was never likely that the university that acquired an iconic status for its students’ opposition to the Vietnam war was going to admit that it had caved in to political pressure. But that’s exactly what had occurred. To be precise Berkeley had buckled under the pressure exerted by a coalition of no fewer than 43 pro-Zionist organisations which had addressed a joint letter to the university accusing the course of peddling hate and anti-semitism. It appears to be this sheer weight of numbers that caused the university to panic. Michael Burawoy, a sociology professor and co-signatory of a letter signed by Jewish professors opposed to the university’s decision said he believed the university had capitulated over concerns about losing funding. Strongarm bully boy tactics designed to scare universities into steering clear of anti-Zionist ideas are nothing new in the US. In 2014 Professor Steven Salaita had a job offer by the University of Illinois rescinded after a Zionist blackballing campaign targeted tweets he had posted denouncing the Israeli invasion of Gaza that summer. Salaita became something of a cause celebre for academic freedom but there were many others. over 200 other professors — Arabs, Jews and others — were identified as being anti-semitic and unfit to teach in a report which called for all federal funding to be denied to those professors and the Middle East Studies programmes they were involved in. All the accused had signed a petition in support of the Boycott Divestment and Sanctions (BDS) campaign to boycott Israeli goods and institutions. The group behind the blacklist was the same one that targeted the Berkeley course which is sponsored by Palestinian scholar Dr. Hatem Bazian. The AMCHA Initiative, an organisation which describes it mission as “educating about, and combating antisemitism at institutions of higher education in America”, cited the course’s connection to the BDS movement. A closer look at AMCHA reveals that it serves the aim of setting the acceptable range of engagement in accordance with the Israeli agenda, as Dr. Bazian puts it. This range is policed by checkpoints that make sure views which question the dominant narrative are excluded. AMCHA functions as a local policing agent to ensure nothing undesirable passes through the checkpoints (analagous to military checkpoints that control Palestinians’ range of movement in their native land). Consequently “any academic inquiry, according to the constituted checkpoint boundaries, should centre Israel and be located within the set of priorities identified and sanctioned by the local guardians of the Zionist narrative. Academic administrators function almost as if they are state department officers guarding and governing the boundaries of engagement of Palestine and anything outside the accepted framework must be immediately closed down”, according to Dr. Bazian. The policing complements other initiatives run by the pro-Israel lobby to maintain the supremacy of their narrative. Bazian points to shared study programmes between Israeli and US students, campus exchanges, visiting faculties and students, and even paid tours by US university administrators to Israel as examples of how Zionists try to ensure that Palestinians are viewed through an Israeli lens. AMCHA’s latest report into anti-semitism at US colleges and universities provides an insight into its tactics which are both deceptive and anti-democratic. Surveying 113 institutions with the highest number of Jewish students it claims an increase in 2016 of anti-semitic incidents over the previous year and a correlation between the increase and the presence of anti-Zionist and anti-Israel (including BDS) movements. Reading beyond the headline figures it soon becomes clear that the study is more concerned with expressions of opposition to Zionism and Israel rather than anti-semitism. The device used to conflate the two is the US State Department definition of anti-Semitism which to my mind is unique outside Israel in considering anti-semitism to be inextricably linked to Israel such that opposing the alleged right of Jews to self-determination or comparing Israeli policies to those of the Nazis can be construed as ant-Semitic. Under this definition all anti-Zionist activities on campuses can be deemed anti-semitic. But even that is not enough for the Zionist lobby. Movements like BDS pose a problem because they are hard to fit inside such even such a generous definition. To get around this problem AMCHA takes the approach of tarnishing BDS by association, ‘finding’ that campuses where there are BDS movements have a higher incidence of anti-semitism. The apparent influence of groups like AMCHA is worrying both for the implications it has on the Palestine/Israel dispute and academic freedom. In fact following the publication by AMCHA of its blacklist in 2014, the Middle Eastern Studies Association said its “real goal seems to be to restrict or even stifle the free and open discussion of, and the vigorous exchange of opinions on, the Israeli-Palestinian conflict on college and university campuses.” The influence has to be seen against the background of countless other colonial studies courses offered by universities on countries other than Israel which have never been subject to the same pressures. The equation of anti-Semitism and anti-Zionism has become a key tactic for the pro-Israel lobby, highlighted perfectly in the response of the Anti-Defamation League to Berkeley’s decision to reinstate the course. “As the title implies, the class thesis and much of its syllabus is built on the foundation of the denial of the Jewish connection to the Land of Israel and the attempt to negate the right of Jews, like any other people, to assert their self-determination,” it said in a statement. The aim is to erect the Zionist project as a marker of Jewish identity and then accuse of anti-Semitism anyone who is critical of it. Of course, we all know the argument is a non sequitur but that’s not the point. Mud sticks and none more so than the charge of anti-Semitism.